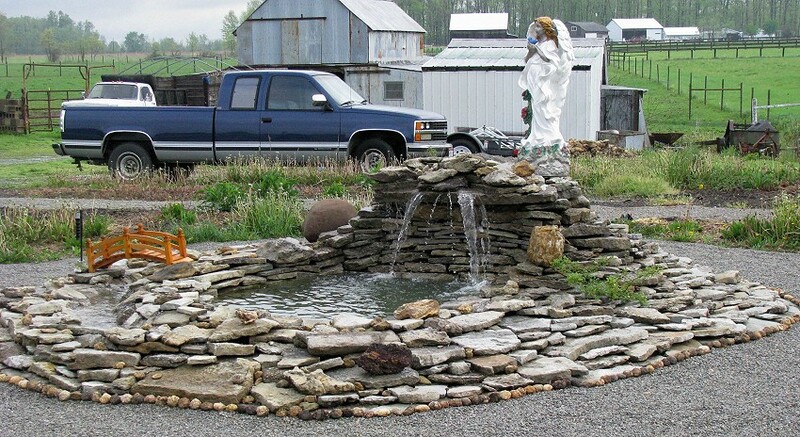 I always wanted a watergarden and finally decided to get started and build one when I lived in Ohio. The side yard was flat, but I had a pretty big pile of dirt in the horse pasture from digging a pond. I had to haul some dirt up so I could have the waterfalls that I wanted. 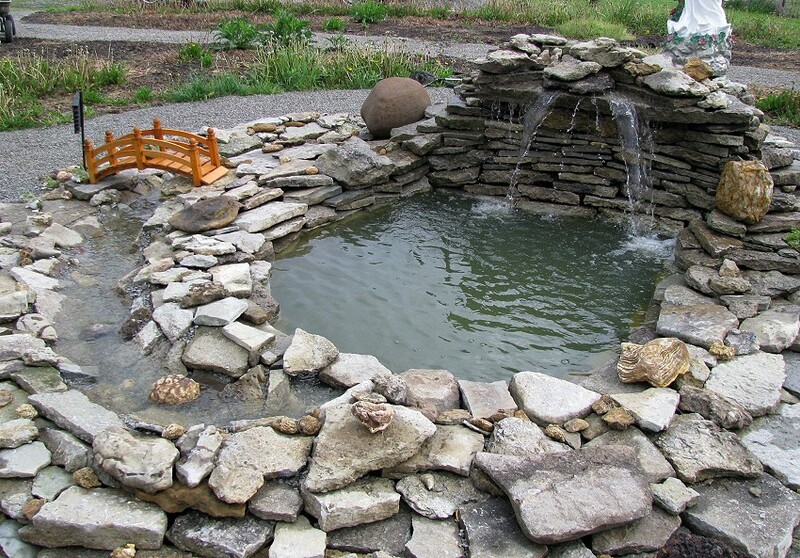 I started out with the lower pool, which is about 15' in diameter and 4 1/2' deep, and the middle pool, which is about 13' X 10', plus the small collector pond on top which gives me the waterfall that I wanted. The building came along a year or so later. When I was a child, we'd often visited Spring Mill State Park in southern Indiana and I was always fascinated by the gristmill there. My replica stands 4 1/2' tall and the water wheel turns strictly by water power. I have a dusk to dawn switch on the back of the building that turns on a single 25 watt bulb inside at night plus turns on a couple of "rock lights" that are buried among the rocks. The windows are frosted so it gives the appearance of old time kerosene lighting. 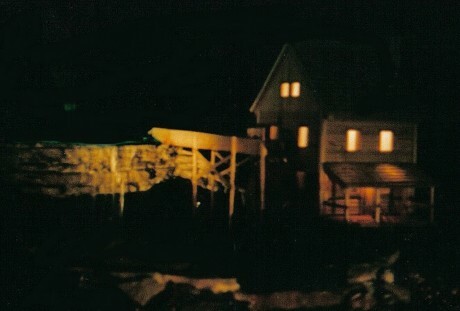 And for those of you who would like to see a closer view of the replica gristmill, I will include a zoomed in photo. The building started off as 19 treated 2 X 4's which were ripped down to a few 2X2's to build the framework, and the rest were ripped down to 2"X1/4" slats to use for the siding and trim. Then several of those were cut into 3" lengths to make the shingles for the roof. 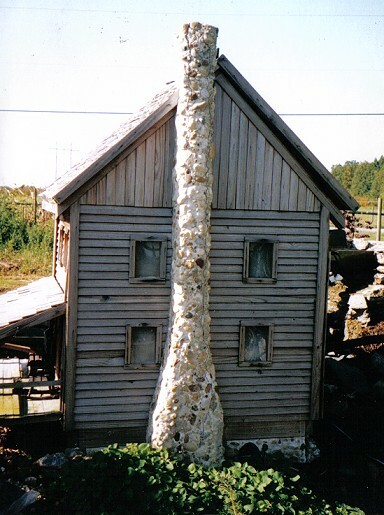 The chimney was built in the living room floor. I started out with a couple of 2X4's screwed together to make a 4X4, then at the bottom, I added a couple of 1 X 4's on each side, one longer than the other to start the shape of the wider bottom. Then I added about a million screws - sticking out about 1/2" to give me something to attach to, then started working in mortar and adding decorative peebles. Then it was lag bolted to the building. Another waterfalls, though on a lot smaller scale, and the stream I wanted. 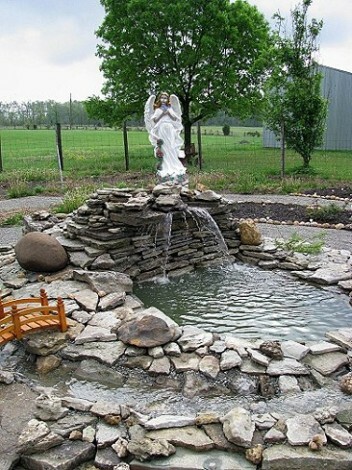 The stream circles around to the back of the pool, under the bridge and into a buried barrel and then is pumped up to spill over by the angel. 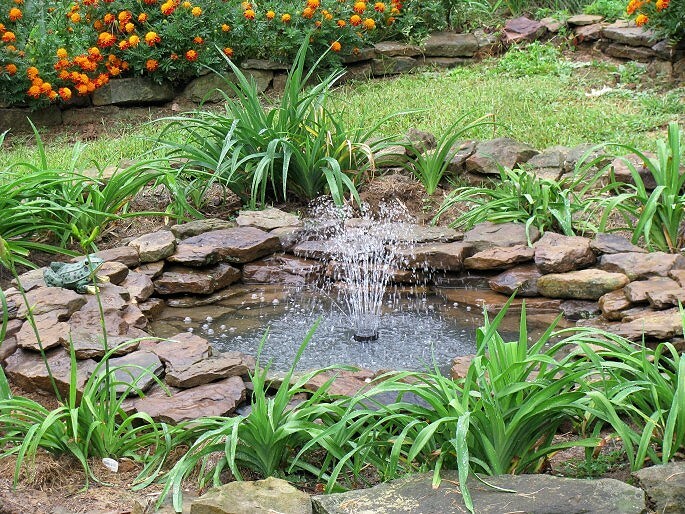 The last water garden that I built is a simple little pool with a fountain. 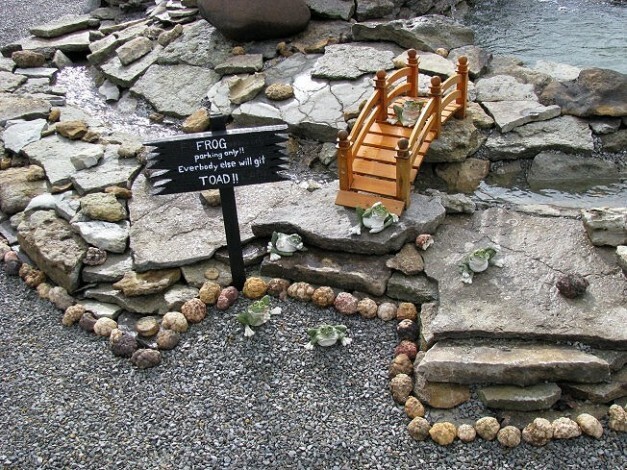 I built this for Mom and Dad in September, 2009. 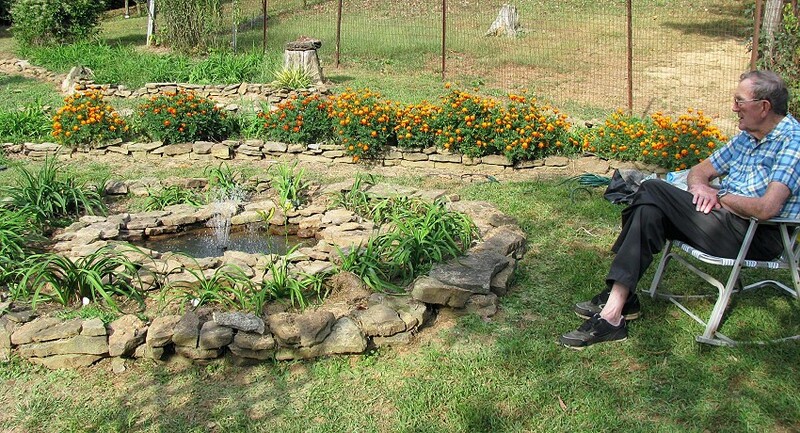 Dad was crazy over it and loved to sit in his lawn chair and look at it and listen to the water. I am so glad that I built it when I did so that he could enjoy it for a little while. Dad passed away in April, 2010. 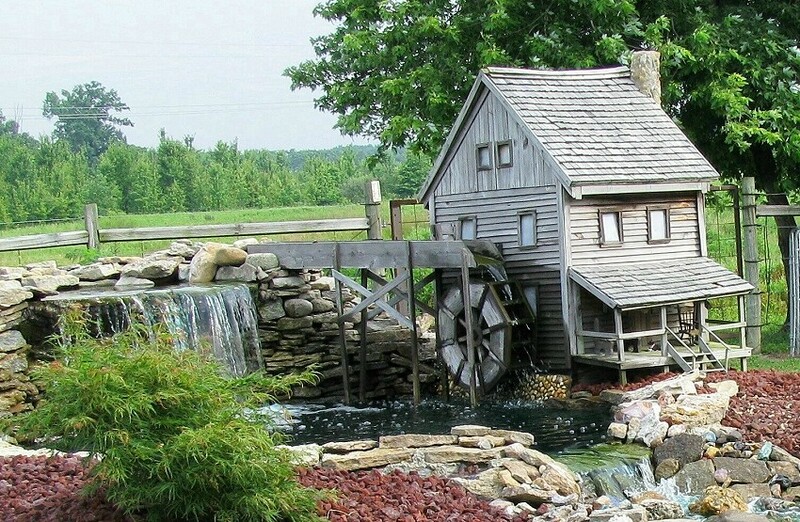 When I left Ohio, I dismantled the little gristmill building and brought it with me to Indiana. 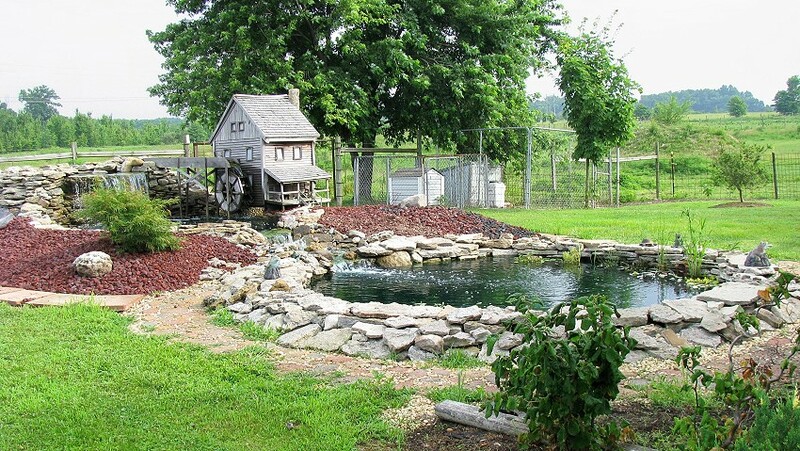 As soon as I have the daylilies in their permanent beds, I will start building another watergarden and will put the gristmill back up.